SEAMLESS REDUCING LATERAL | WFI International, Inc.
WFI has invested in new NC/CNC machine tools and forging dies to more efficiently produce large seamless Wyes and Laterals for the power and energy industries. WFI also utilizes in house programs including Finite Element Analysis and Three-Dimensional CAD/CAM to assist in the drawing, design and machining of these parts. WFI has the ability to produce fittings such as Wyes and Laterals with as near as uniform wall as possible while maintaining the strength of the fitting using the pressure area method of design and finite element analysis where required. WFI understands that uniform wall thickness and smooth rounded external and internal surfaces are extremely important as they relate to both thermal stress and stresses from external forces that these parts experience in service. 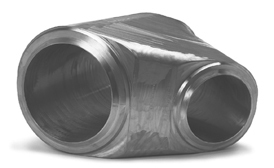 Seamless Laterals and Wyes, used primarily in high pressure steam lines and in high pressure subsea piping are subject to high thermal and reaction stresses due to excessive section thickness compared to the mating pipe. WFI’s unique manufacturing process allows us to produce these parts with maximum radiuses and a more uniform wall thickness which results in greatly reducing these stresses.